The owners of this small home with a basement garage in Steilacoom asked SLA to add a second floor and remodel the main level of their home. The design incorporated an existing deck and created a covered back yard terrace. In order to trim costs, the design utilized only the existing foundations. Exterior cedar siding gives the building warmth. 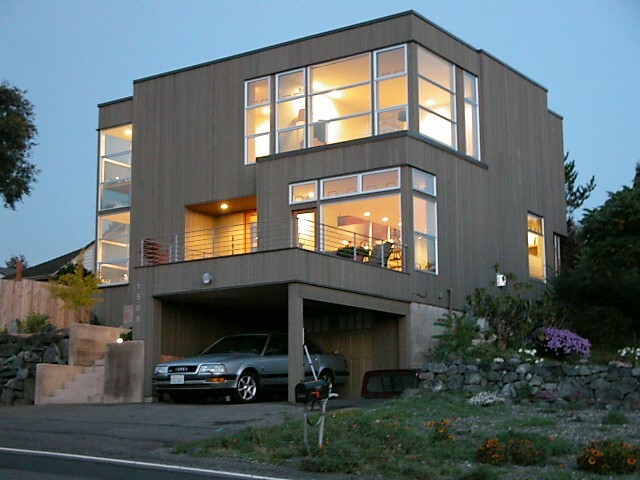 Extensive windows provide views to Puget sound from both levels and give the small home a larger feel. With a reconstruction of modest cost over an existing foundation the owners acquired a larger, modern and delightful new home.